The year 2011 was all about Pakistan's resurgence as a cricket team as we witnessed Pakistan go undefeated in all test series, reach the semi finals of the World Cup, and end the year with the best W:L ratio in ODIs and the second best in tests. The icing on the cake came at the start of 2012 when Pakistan whitewashed the world's number 1 test team, England, 3-0 in the test series held in the UAE. While 2012 had started with Pakistan clean sweeping the world's test champions 3-0, 2013 has started with Pakistan defeating the world's ODI champions 2-1! Having lost ODIs to India in 2010 (Asia Cup), 2011 (World Cup), and 2012 (Asia Cup) and no bilateral ties between the teams, an ODI win over India had been a long time coming. Since 2009, Pakistan had not beaten India in an ODI, which makes this 2-1 series victory even sweeter. I have discussed numerous reasons for Pakistan's success on Well Pitched in the past including Misbah Ul Haq, Shahid Afridi, the influence of Waqar Younis and Mohsin Khan, the non-interference of Zaka Ashraf, and a stable batting line up, among other things. Here are three more reasons that have added to Pakistan's success in recent times, and more so in the just concluded ODI series against India. 1. PACE ATTACK IS BACK ! 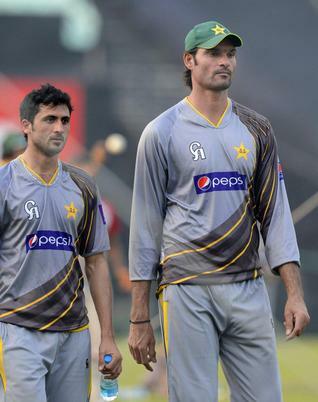 India's "world-class batting line up" was completely exposed by Pakistan's newly found new ball pair of Junaid Khan and the 7-foot tall Mohammad Irfan. Gambhir, Sehwag, Kohli, Yuvraj had no answer to the pace, bounce, and swing generated by Junaid and Irfan throughout the 3-match series and were found wanting every time they were at the crease. 29-5, 95-5, and 111-6 are not the sort of scores one expects from an Indian batting line up playing on Indian pitches. In England or Australia, one might even think that its possible, but in India? Never have the Indian batsmen looked so helpless in front of any bowling attack on their own turf. Virat Kohli, who amassed century after century for India over the past year and a half, and mauled Pakistan in the Asia Cup and the World T20, was left looking like a school cricketer by Junaid Khan. Kohli managed scores of 0, 6, and 7 in the 3 ODIs and each time lost his wicket to Junaid Khan. Yuvraj Singh managed 2, 9, and 23; while Gautam Gambhir managed 8, 11, and 15. Virender Sehwag, who was dropped for the 3rd ODI, scored 4 and 31. Pakistan's new ball pair has not looked as potent as Junaid & Irfan since the days of Aamer & Asif, which was over two and a half years ago. From Wasim-Waqar to Shoaib Akhtar to Aamer-Asif, Pakistan have finally found two genuine fast bowlers that will trouble batsmen world over. Their combination has hurt India badly and from what we have witnessed, there is a lot more to come. The wickets column might not look that bright for Irfan, but it has been his control and the pressure that he has applied from one end, which enabled Junaid to pick up all those wickets. They both worked extremely well in tandem and didn't provide any breathing space to the batsmen. Junaid ended the 3-match series as the joint leading wicket taker with 8 wickets at an average of 12.4 and an economy rate of 3.67. Those are absolutely magnificent figures for a pacer on Indian pitches. The fact that he took as many wickets as Saeed Ajmal goes to show how effective Junaid was during the series. Except for one, all of Junaid's wickets were of top order batsmen: Kohli (3 times), Sehwag, Gambhir, Yuvraj, Rohit Sharma, and Ishant Sharma. At 23, Pakistan have found a potent new ball weapon; and he has a great partner in Mohammad Irfan. Here's hoping that neither falls prey to injuries, dope, or spot fixing! Saeed Ajmal is the top ranked bowler in the world in ODIs, while Mohammad Hafeez is ranked number two. With the world's two best ODI bowlers controlling the middle overs for Pakistan, any batting side will find it difficult to maintain any sort of momentum. Ajmal and Hafeez are the ideal bowlers to come on after Junaid and Irfan have softened up the batsmen. Pakistan's bowling attack has once again found that magical combination of 5 attacking components where each one of them is a genuine wicket taker. If Junaid or Irfan don't get you, Gul will. And if Gul doesn't, Ajmal or Hafeez will. Pakistan is at its most dangerous when it plays attacking cricket, and its current crop of bowlers know no other way. The quality of Pakistan's bowlers can be judged from the fact that Wahab Riaz, Anwar Ali, Raza Hasan, Abdur Rehman, and Shahid Afridi are not even a part of Pakistan's first choice bowling attack! In Mohammad Hafeez and Nasir Jamshed, Pakistan have found arguably their best opening pair ever. No batsman has dominated Pakistan's opening slot in all three versions of the game the way Mohammad Hafeez has in the past 3 years. At the same time, no Pakistan opening batsmen has looked as dominating at the crease as Nasir Jamshed since days of Saeed Anwar. And together, they have formed an explosive pair who have notched up 4 century partnerships in the past year - more than any other set of Pakistan openers. Saeed Anwar and Aamir Sohail, thought of as Pakistan's best opening pair ever, managed 3 century stands in 10 years. 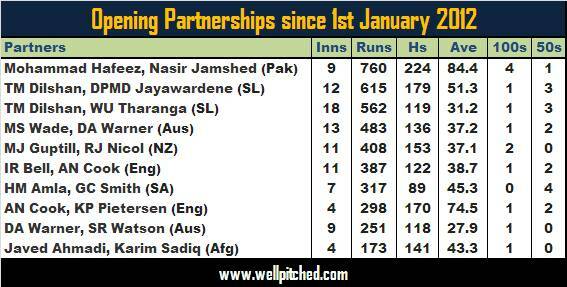 In only a year of opening together, Hafeez and Jamshed have put on 760 runs for the opening stand at a phenomenal average of 84.4 in 9 innings. That is the 11th highest runs tally for a Pakistan opening pair, the highest ever average, and they also boast of the second highest ever opening partnership for Pakistan - 224 against India in the Asia Cup last year. 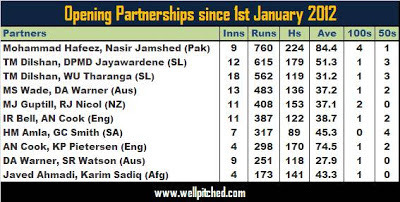 Not only are Hafeez and Jamshed one of the best opening combinations for Pakistan, they are the leading opening pair in world cricket in ODIs over the past year. Most runs together, highest average, highest opening partnership, most century stands - Hafeez and Jamshed stand above all other opening pairs in ODIs. Better than Watson & Warner, better than Amla & Smith, better than Cook & Pietersen, better than Dilshan & Jayawardene! It has been a great start to the year for Pakistan, however a bigger test, the greatest test in recent times, awaits them in South Africa. I believe that we stand a good chance to compete strongly against South Africa given the potency of our bowling and the increasing stability of our batting. Pakistan's cricketing rise over the past two years is a story for the movie makers. This story was considered complete with victory over England last year, but this victory over India has made it all the more sweeter!